I’ve been searching my wardrobe all this week to find a black-tie appropriate dress to wear to a charity gala I’m off to tonight in Ireland. I can’t remember exactly why that lead me to this super-expensive Valentino Embroidered Tulle Gown, but I’m pretty chuffed it did. Obviously I could never afford a dress of this kind but that hasn’t stopped me imagining myself twirling around in it. It’s an absolute show stopper. Everything is perfect. 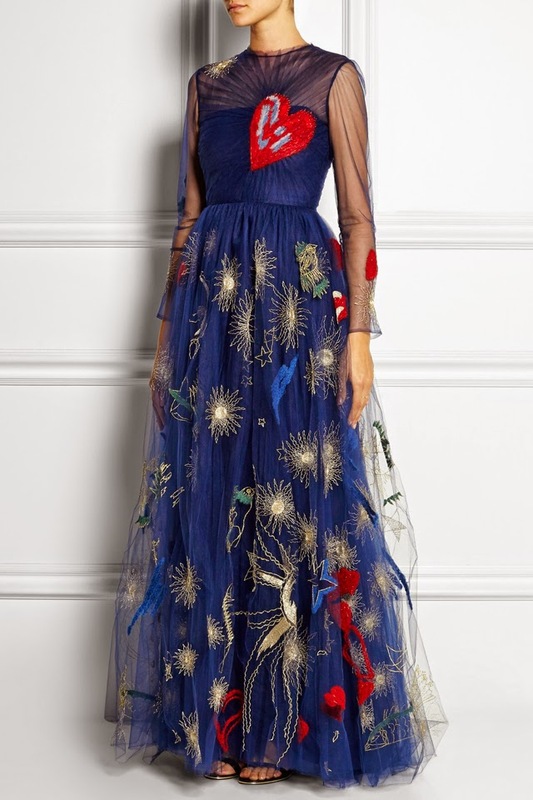 The stormy blue colour, the sheer long sleeves, the giant embroidered heart on the bust, the fitted waist, the flared skirt covered in stars and birds and god knows what. I’ve even been dreaming about this baby when I sleep. Imagine the reception you’d get as you glide (because that what seems appropriate in this dress) into the room and take to the dance floor. I’d be there all night, just twirling round and round and round. I’d be so happy, I’d never want to leave. Or take it off for that matter. It’s a dress of such beauty that I really don’t feel like my words are doing it justice, so I’d ask that you take two minutes to really look at it. Take it all in. Then join me in the world’s biggest sigh as the realisation hits that you’ll never ever get to try it on. Now excuse me while I go back to my dreams… It’s much better there.